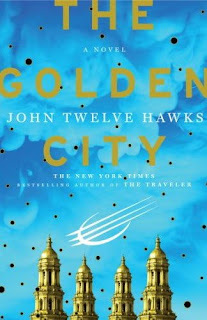 I have one hardcover copy of John Twelve Hawks' The Golden City recent release up for grabs. This is the third volume of the Big Brother SFish Fourth Realm Trilogy that started strong with The Traveler and followed with The Dark River. Send an email to madpye (AT) yahoo (dot) com with your full name and snail mail address with "GOLDEN" in the subject line. The deadline is midnight October 5th. I'll announce the winner the following day. This contest is open to the people of the United States and Canada only (sorry rest of the world). If you send multiple entries you will be disqualified from the contest.